Create Nintendo Account Before Launch Day and Receive My Nintendo Platinum Points. 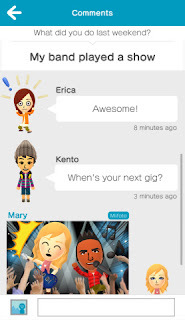 Nintendo’s first-ever app for smart devices, Miitomo,launches next month, but now’s the time to sign up to receive a notification when the app is available for download. Now through launch day, anyone can preregister for Miitomo by signing up for the new Nintendo Account service at http://www.Miitomo.com and be among the first to be notified about the availability of Miitomo when it launches in March. Those who create their Nintendo Account before the launch of Miitomo will also receive Platinum Points for the new My Nintendo rewards program, which will launch simultaneously with Miitomo. Miitomo is a free-to-start social experience that lets you spark conversations with your friends in a whole new way and uses Nintendo’s Mii characters, which first debuted with the launch ofWii Sports in 2006. More than 200 million Mii characters currently exist across Nintendo systems worldwide. To get started, users can quickly create a Mii character, customizing its facial features, eyes, hair, as well as voice and personality. Users can also use the camera of their smartphone or tablet to snap a photo that will be translated into Mii form, or they can simply import their Mii from the Wii U or Nintendo 3DS systems using a QR Code. For more information about Nintendo Account and Miitomo, visit http://www.Miitomo.com.